Description: Designed with a clean round profile that fits into the homes and structures of nearly any architectural era, this ceiling pendant defines a distinctive sophisticated aesthetic. 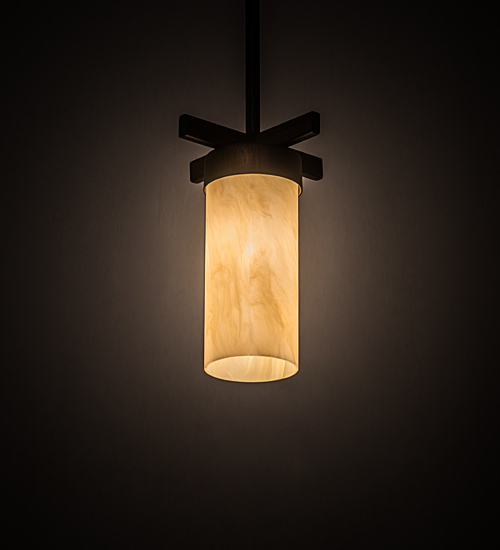 The cylindrical Botticino Idalight shade is enhanced with crossbar styled hardware featured in a Cimarron Bronze finish. Place these mini pendants on a bar, counter, island or table to create a dramatic design statement. Handcrafted in the USA, this fixture is available in custom colors, styles, and sizes, as well as dimmable energy efficient lamping options. The 8-inch wide fixture is UL and cUL listed for damp and dry locations.